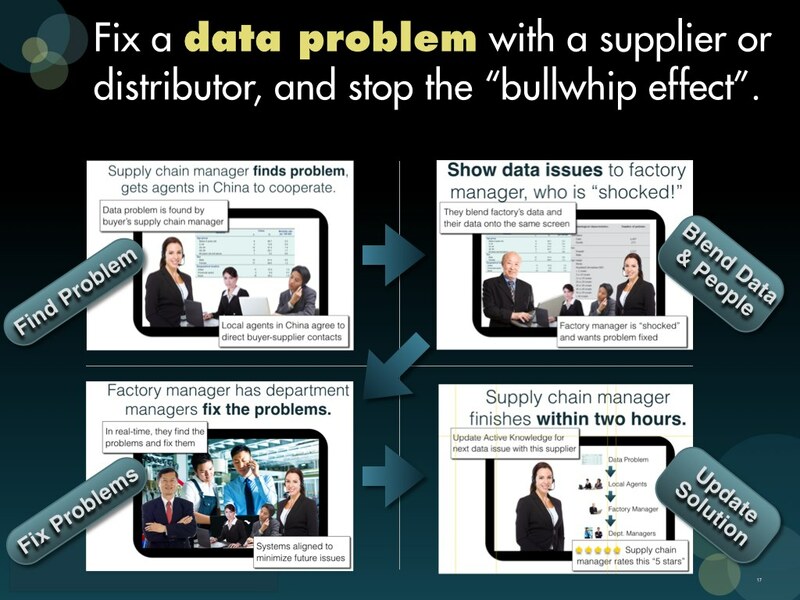 Unreliable data in a supply chain causes the well known problem of the “bullwhip effect.” Because it is common for data to be unreliable today, a typical “fix” is to over-order by 10% to 15% to protect your ability to deliver on time. Because multiple parts of the supply chain over order, this causes the “bullwhip effect.” The result is an over-stuffed supply chain with profit sucking costs drained by too much manufacturing, shipping and inventory. Then too many clearance sales fulfill demand at cheap prices, simply to get rid of the excess. Like unreliable data, too many of today’s supply chain problems must be accepted and adjusted to. An Expandiverse Shared Space can be pre-configured based on Previous Solutions, ready to be deployed as “capability packages.” Each Shared Space is a collection of continuously connected people and resources in an Inactive state, ready to be Focused with each of its parts made Active as it is needed. With Active Knowledge, this includes the protocol and steps to take corrective actions, for real-time responsiveness to a specific supply chain issue. Situational Active Knowledge provides clear goals, with the steps to reach them. To deal with different kinds of supply chain issues, a single Shared Space may have several saved states each with associated Active Knowledge steps. For example, that Shared Space could be used to deal with multiple different supply chain issues. To start use, a supply chain issue or trigger can be associated with one or more Previous Solutions. When one type of issue occurs a Previous Solution can be selected and its Shared Space configuration can be Focused with the relevant people and resources ready to be Activated, and the appropriate steps listed as its Active Knowledge. The set of Previous Solutions enables a company to deal with recurring supply chain issues in real-time. It becomes an integrated, networked organization that can operate both pro-actively and responsively in real-time. As more solutions are developed, their participants, resources, steps and outcomes can be instantiated in Shared Spaces, and documented. Each solution can be categorized and associated with an issue and/or trigger. Over time, there is also an ability to use procurement contracts to win cooperation by agents and prime contractors, providing everyone with incentives to collaborate and develop direct relationships that identify and solve issues immediately. London: 8 to 10 AM West Coast time is 4 to 6 PM in London. China: 4 to 6 PM West Coast time is 7 to 9 AM in Hong Kong / Beijing / Shanghai / Shenzhen. This is one step toward a real-time supply chain that has a higher level of capabilities than today. As the world becomes increasingly networked, new levels of access add the freedom to operate everywhere on our Digital Earth. This simultaneously includes multiple suppliers, logistics vendors, channels, partners and markets. 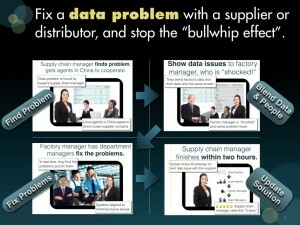 Share the post "How to Solve Supply Chain Data Problems Immediately Worldwide"